A relative who recently visited England quipped that all British people do is watch American shows, while in America, we are mad about the British. I thought this was very amusing since I am definitely guilty of practicing “anglomedia”. I prefer the sharp acting, more roundly developed stories, and delightful accents (of course) to the often wooden and predictable performances of American actors as network executives desperately try to create hits based on stiff, formulaic plots. Hollywood is slowly catching English fever. British actors Idris Elba, Gugu Mbatha-Raw, Benedict Cumberbatch, and Emily Blount have frequently been casted in multiple Hollywood movies. This new “British invasion” has translated to millions of dollars as well as a fresh look across the pond to find new talents and better stories. 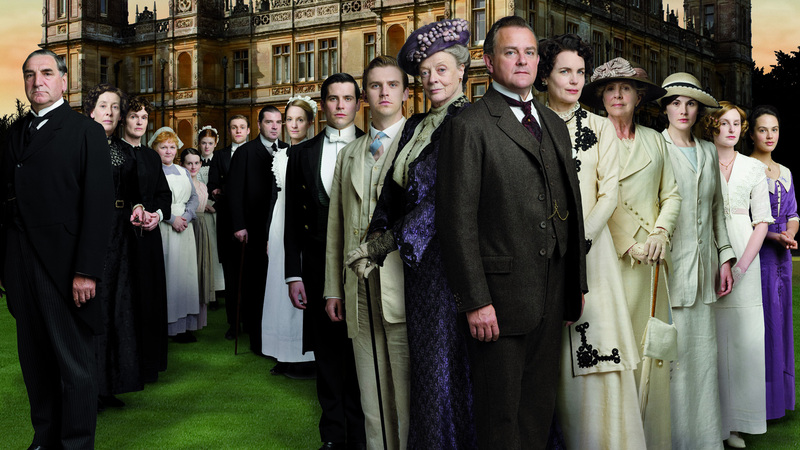 “Downton Abbey” (incorrectly pronounced as DownTown Abbey by many Americans) has no equal among American television series. The last series that riveted most of America was “Roots” or perhaps the cliffhanger last episode of “Dallas” (i.e. Who shot J.R.?) way back in the 1980’s. So what is the reason behind this phenomenon? Is it all a matter of taste or something much more specific? Many American tv shows often rely on violence to keep audiences coming back. Simply compare the most popular American and British tv series on imdb.com and you will see my point. English shows have more diversified storylines and more family appropriate subject matter while American tv series standardize vulgarity and direct it to adult audiences. Furthermore, the acting performances on many tv shows is hardly inspiring. Many popular American actors proudly admit to skipping acting school and “winging it”, type casting themselves while most English actors are very well trained to master a variety of accents and characters. Even the British gossip about the Royals is infinitely more interesting and amusing that the latest ridiculous Kardashian hoax. British celebs tend to have a lot more respect for their craft and themselves. To be fair, the Brits can be very cheeky, going back to the days of Benny Hill, but even then his silence conveyed more than the dialogue heavy American shows (it’s a cardinal sin to have even 5 consecutive seconds of silence on an American tv show). The continuous dry banter leaves audiences feeling flat. The recent slew of cancelled tv shows proves that beyond a doubt. There is an obvious humility to British actors that American actors lack. After Benedict Cumberbatch’s phenomenal voiceover as the dragon Smaug in the Hobbit, he still returned to his popular Sherlock series. When an American actor scores a major motion picture, he/she avoids tv series like the plague unless they are doing a cameo performance. But since movie budgets have recently stagnated due to the dismal U.S. economy, many former A-listers find themselves competing for poorly written and often short lived series. Fox Network is currently adapting the British series “Luther” for American tv. NBC’s attempt to adapt a British series failed. So despite its significant headstart on entertainment and reputation for being the entertainment capital of world, America has again fallen behind, as it did with public school education. Despite efforts to copy popular British series, American tv will continue to suffer from stifled creativity while British shows stream a seeming endless flow of entertaining shows and believable talent. Author: Colette Byfield Screenwriter. Blogger. International optimist. "Everything I've learned is from books and movies." Follow me on Twitter @colettemoviemaven so we can talk about movies, books, and books made into movies.